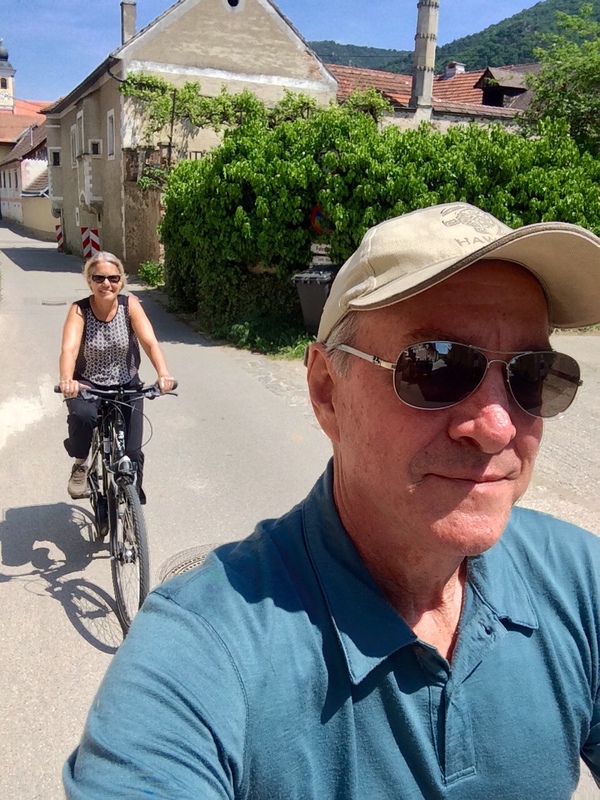 On Monday, we set out on the train from Wien Spittelau Bahnhof (“Wien” is German for Vienna) to the town of Krems an der Danau for an overnight bike ride along the Danube River to Melk. 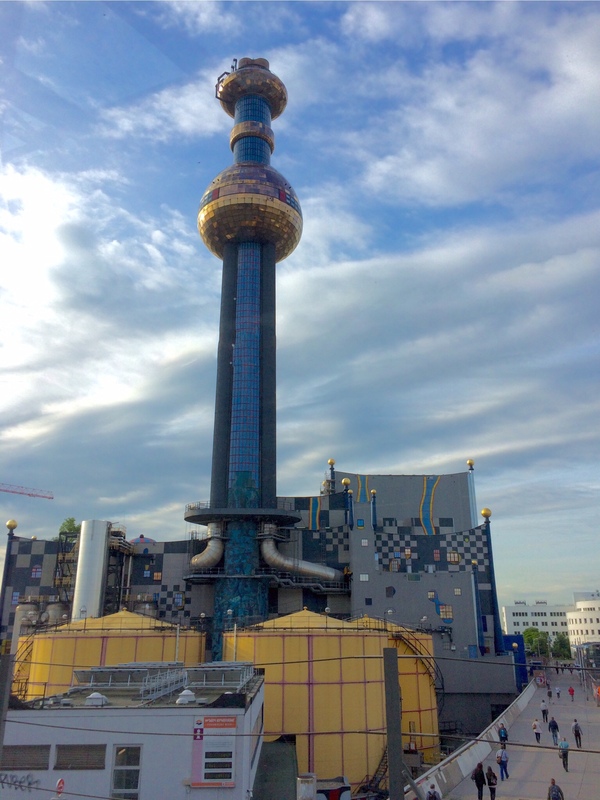 Across from the train station was another Hundertwasser creation, a garbage incenerator known as the District Heating Plant Spittelau. Hundertwasser literally turned garbage into money with this project, creating a tourist attraction out of garbage disposal. 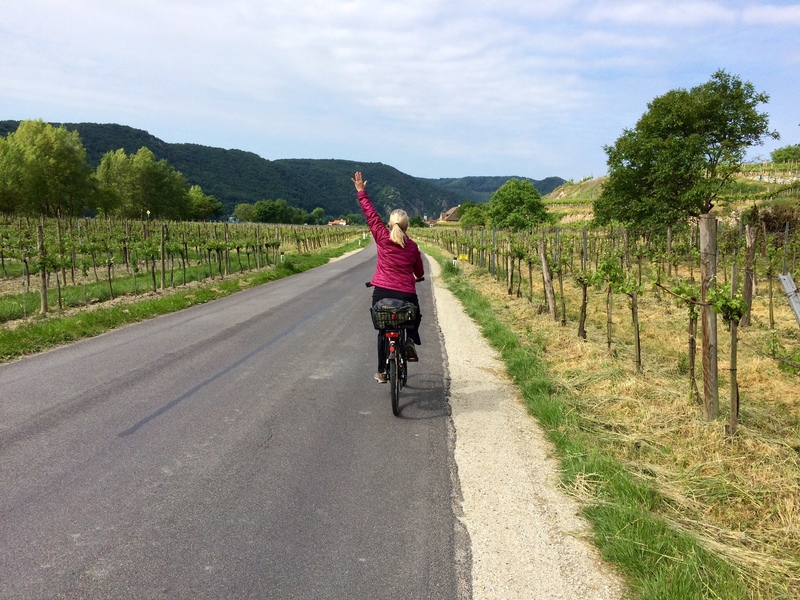 We arrive in Krems, supposedly the oldest extant town in Austria (established by 995 A.D.), and found a nearby cycle shop, rented a pair of bikes, tucked our backpacks into the baskets, and then off we went, peddling through the Austrian wine country known as the Wachau Valley, yet another UNESCO World Heritage Site. 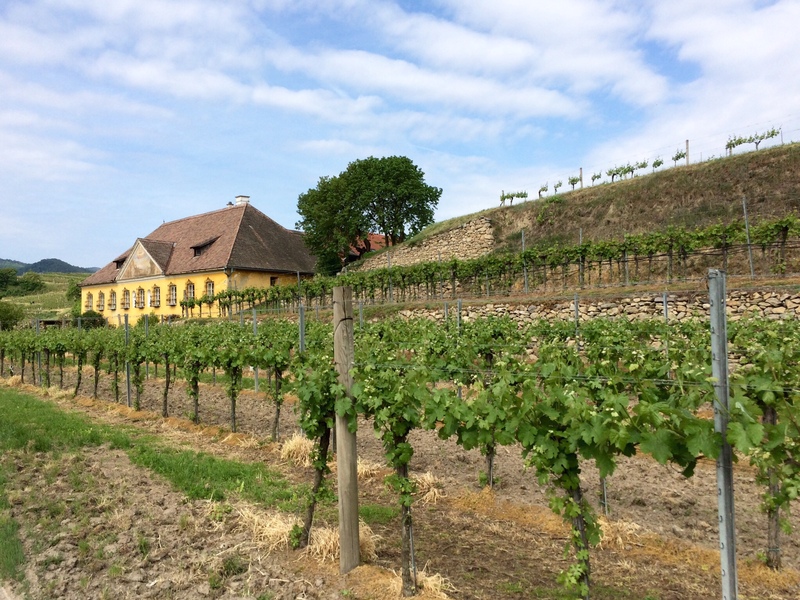 Unlike other wine regions we've visited, the terrain here is quite steep as the land rises from the Danube River and the valley floor, so the farmers have terraced the land to maximize their planting areas. 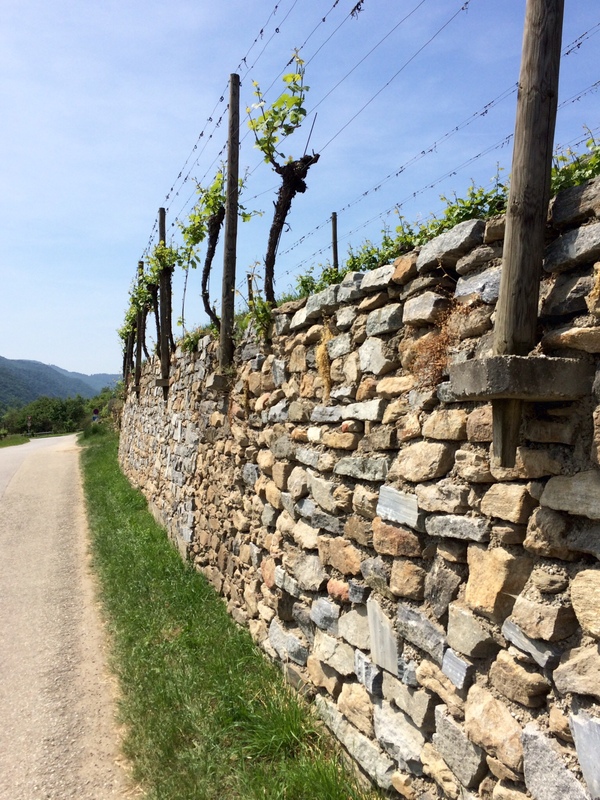 The terraces are butressed with hand-built stone walls and the grape vines are planted all the way out to the edge of the fields. 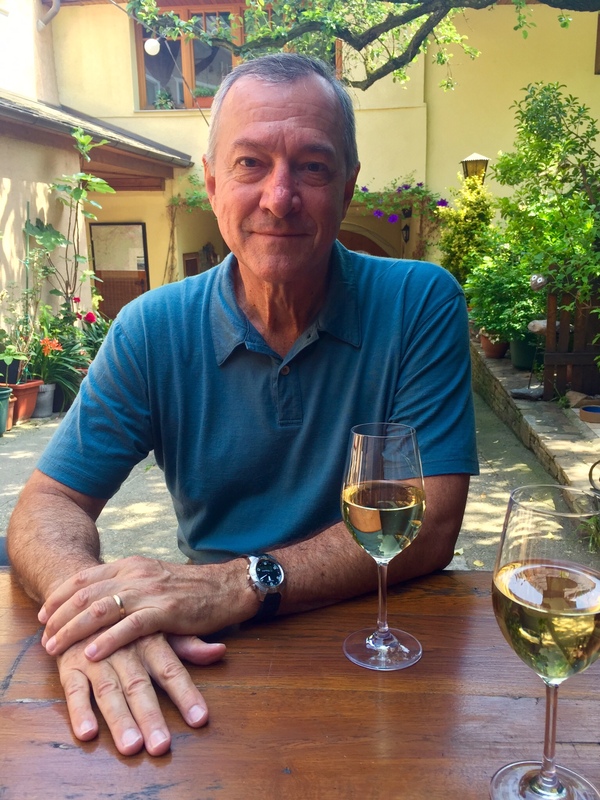 Having recently hand built a stone wall at our home in Washington, we can attest that this took years – perhaps centuries – to do (I read that terracing began in the 1600s here). 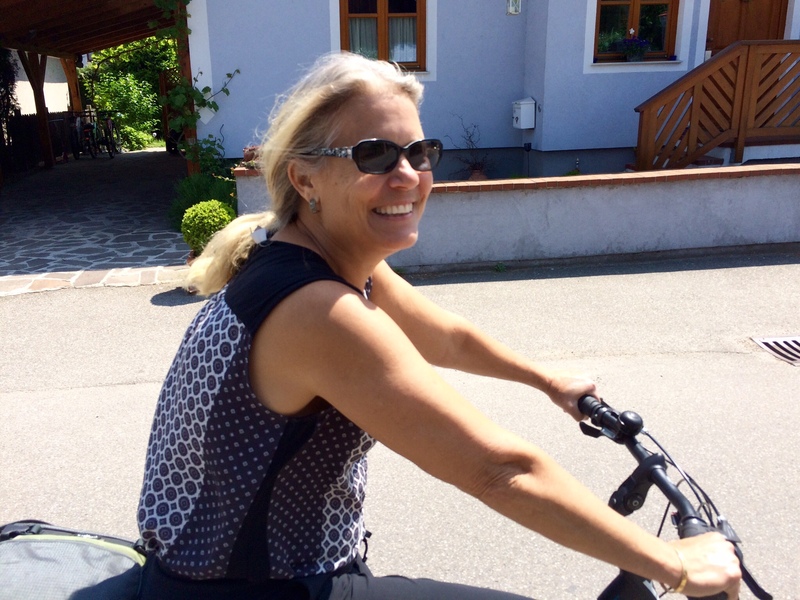 Hiking and biking along this stretch of the Danube is a popular thing to do, especially in the summertime. We were happy to be here in the late spring so we could avoid the crowds. 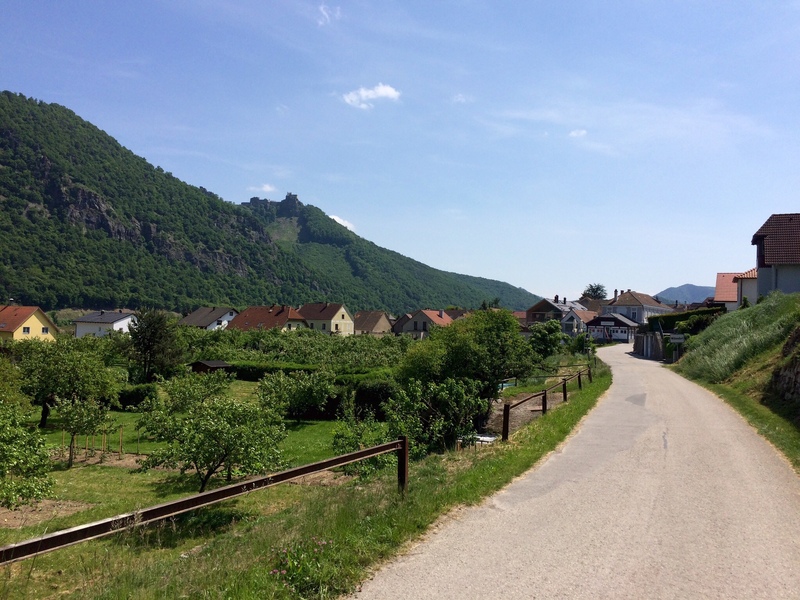 The bike paths are well maintained, scenic and safe, passing through a number of medieval villages, scuh as Dürnstein (where we hiked up to castle ruins – more on that later), Weißenkirchen in der Wachau (lunch), Spitz (another castle), Willendorf in der Wachau and Aggsbach Markt. 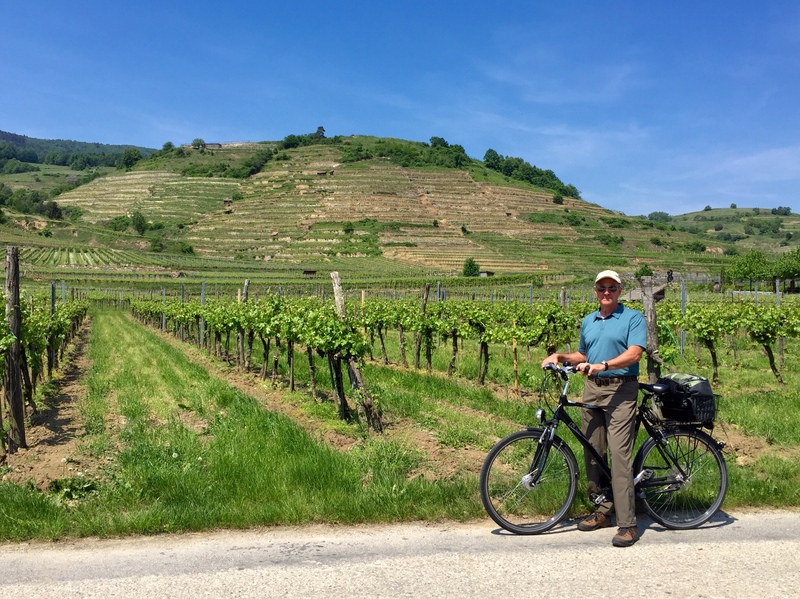 We stopped for lunch in Weißenkirchen and decided to sample the local Reisling, the principle variety grown in this region. As you can see, it put a smile on our faces! The day had started out a little overcast and cool, but it cleared and warmed up nicely. There weren't too many people out today and most of the folks we saw were going the otherway, including a couple long-distance bikers. 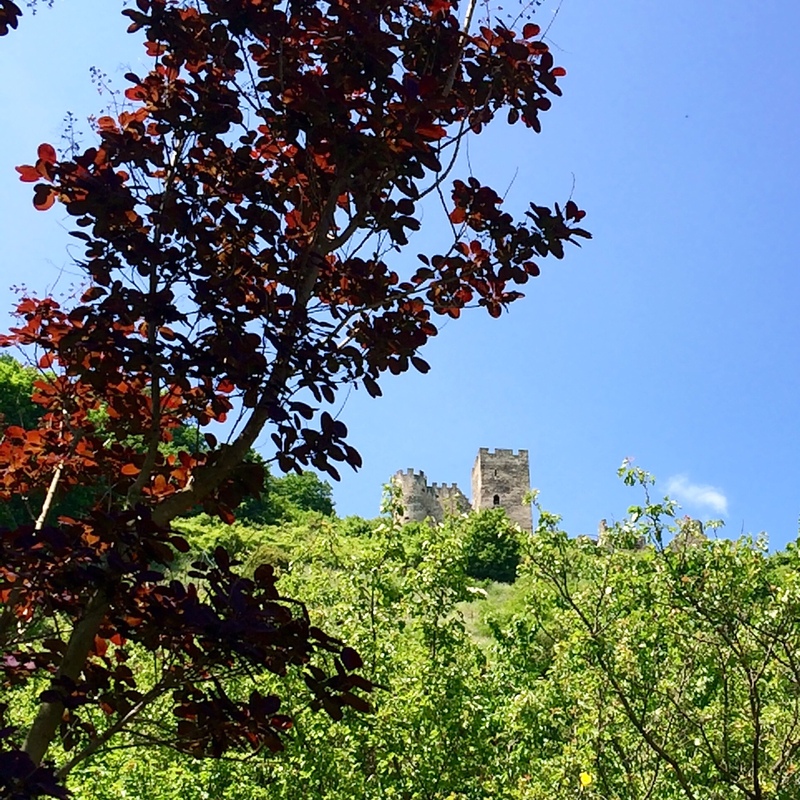 We made sure to stop to smell … the grapes. 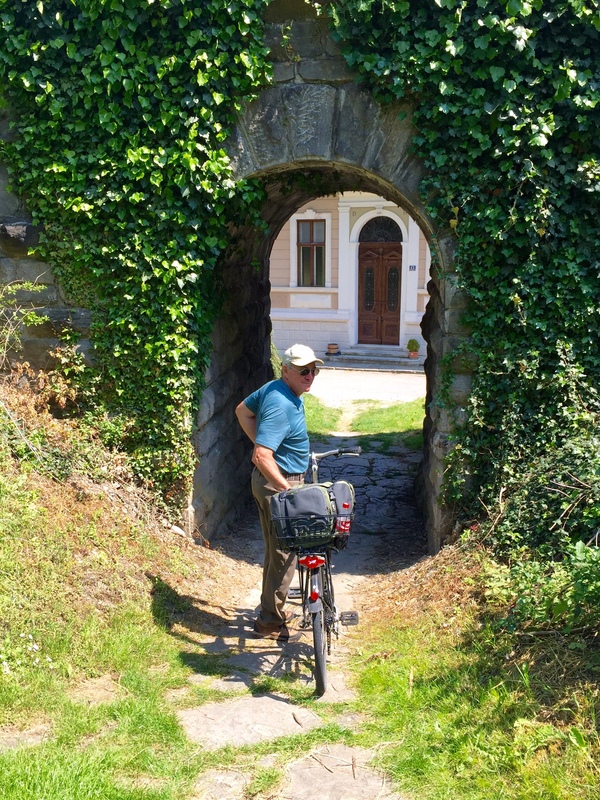 … passing under a stone archway supporting the railroad, above, but we decided not to make the hike up to the castle ruins. A little further along, we stopped for a few minutes to rest in the shade of one of the many stone walls. 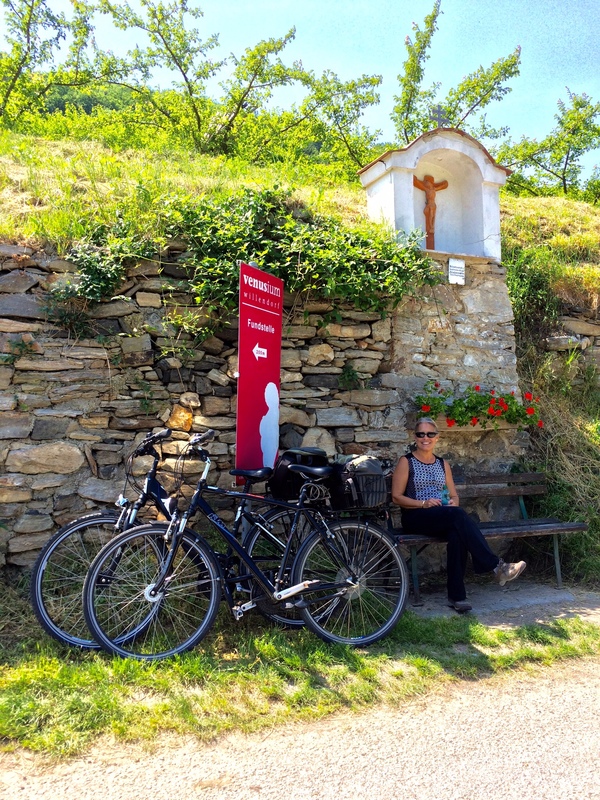 As in other Catholic countries we have visited (France, Argentina, Chile), there were a number of shrines along the roadway. 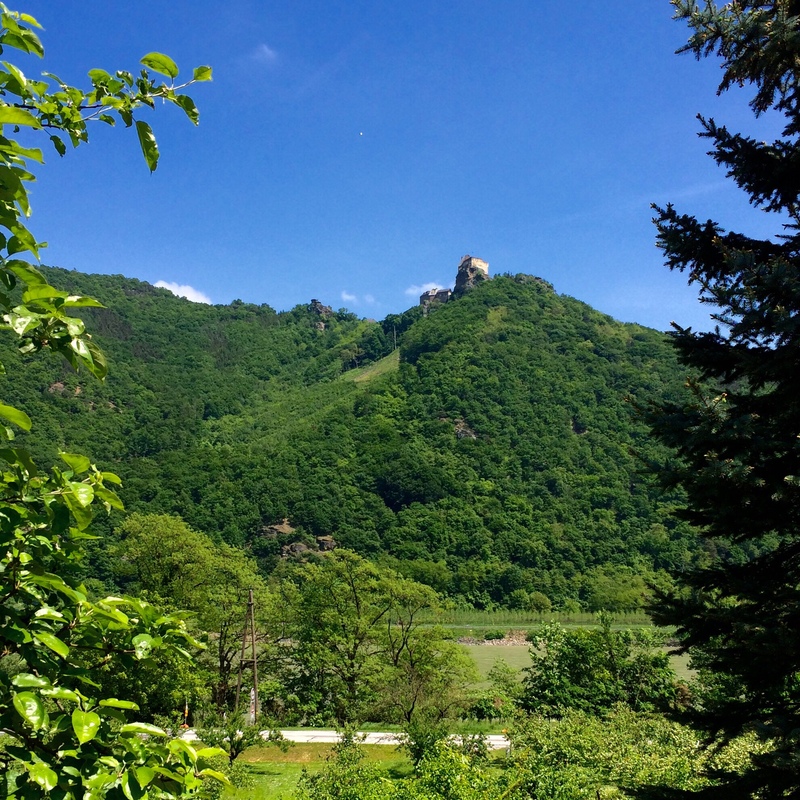 … we could see the castle ruins known as Ruine Aggstein high up in the hills on the opposite side of the Danube. 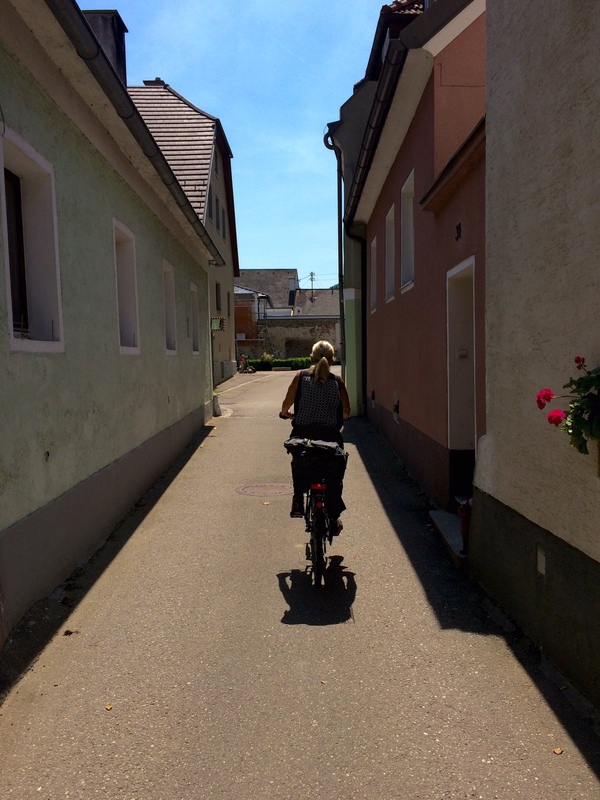 We peddled through Aggsbach Markt, anxious to get to our destination, Melk, so that we would have time to walk around town before dinner. Mission accomplished! 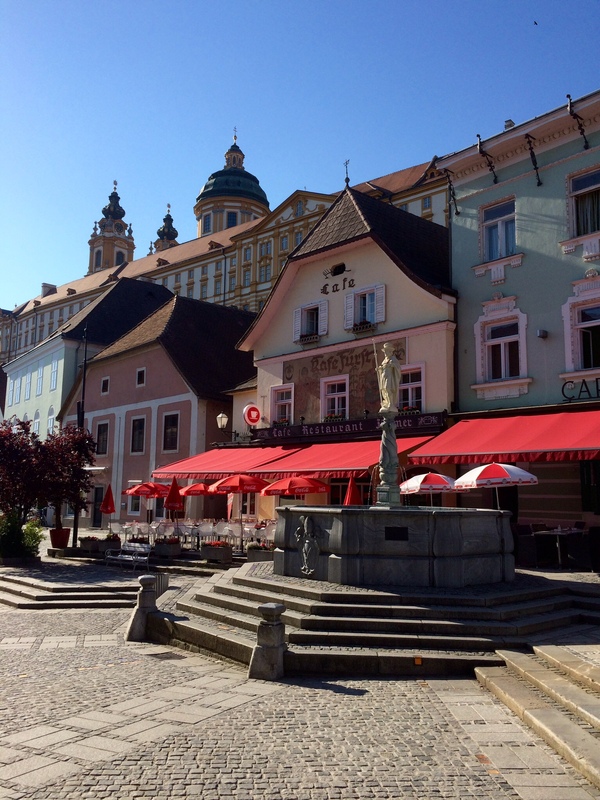 Here's our “hotel” in Melk, the Madar Café, in the heart of the old town, directly opposite the square from the Rathaus. Dale found a gem with this one.